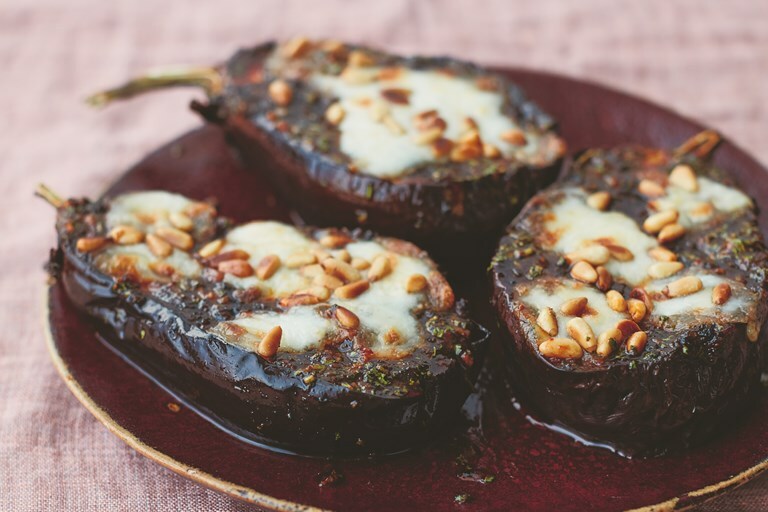 This baked aubergine recipe sees the vegetables topped with a zingy fresh chermoula, molten mozzarella and toasted pine nuts for a little crunch. While it serves four as a side dish or starter, the dish could easily feed two as a wonderfully fragrant vegetarian main. This recipe is taken from Casablanca: My Moroccan Food by Nargisse Benkabbou (Mitchell Beazley, £20). Image by Matt Russell. The aubergine is one of my favourite vegetables, and whether it’s roasted, braised or burned, I have rarely been disappointed with an aubergine dish. I find it incredibly creamy once cooked and it literally works with everything. When I am in a rush, my go-to meal is a roasted aubergine because it’s so simple and quick, and it always keeps me full and satisfied. But I am the happiest on those lucky days when I have the right ingredients in my fridge to make my sweet chermoula to go with it!